The first final of the day would see the youngest (8-11yrs) drivers battle 12 laps of the Paladino circuit for victory. Harry Hannam lead the field around when Douwe Dedecker had a bad start and dropped back the order. Hannam then got shuffled out wide at turn 4 back to 7th as Mitchell Van Dijk took the lead on Lap 3. By Lap 5 the Belgium Dedecker, who had pace all through the heats, took over the mantel followed by Van Dijk and Brent Crews These three drivers were able to create a clear gap at the front as they pulled away from the rest of the pack, with Van Dijk dropping a few kart lengths back. It was on Lap 7 that the American Brent Crews decided he would take a turn at the lead but it wasn’t for long as over the next few laps he switched positions with the Belgium multiple times. These battles allowed Van Dijk to catch back up to contention and as Crews defended on the last lap it slowed Dedecker down and allowed Van Dijk the chance to make a move for 2nd. This in turn allowed Crews to pull out just enough to be unchallenged to the flag as the driver from Denver, Colorado to take the title of Grand Finals Micro MAX Champion 2018. Douwe Dedecker didn’t give up the fight for 2nd and returned the favour on Van Dijk at the last corner for them to come home 2nd and 3rd. Pole man Harry Hannam had a good race to fight his way back up to 5th position. Next it was turn for the 11-13 year old drivers to take to the track and show the World what they can do. The French Polesitter Evan Giltaire lead Farin Megger who started right behind him into the first corner and they already started to break away by the end of the first lap as the pack behind them were fighting, at times 4 karts wide. Van Ruiten in 3rd started to get his head down and gave chase to the leaders towing Augustin Bernier along with him. On Lap 8 Farrin Megger took the lead when it looked like the race leader Giltaire was suffering from a mechanical issue. 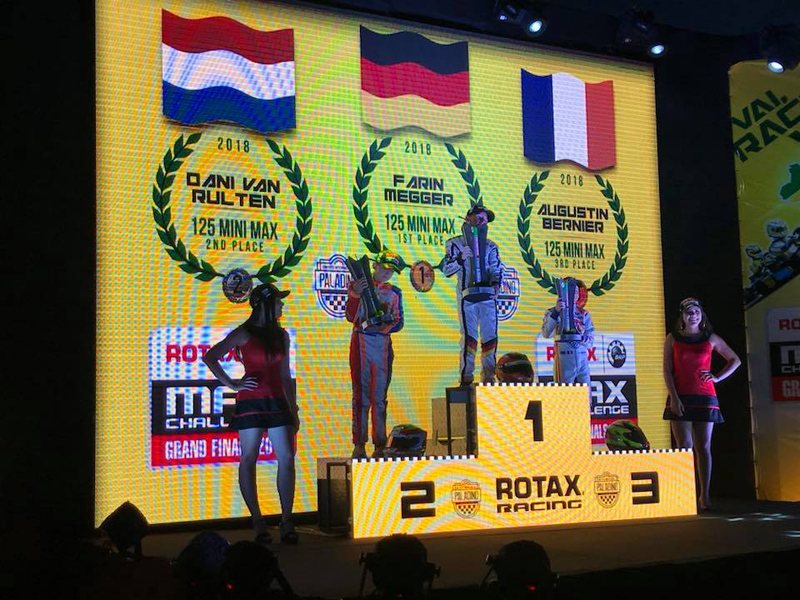 Dani Van Ruiten gave chase to the leader and was making ground but ran out of laps as Germany took their first ever Grand Finals victory with Farin Megger with Van Ruiten taking 2nd and Augustin Bernier in a somewhat lonely 3rd. The race leader for many laps and pole man, Giltaire eventually finished in 11th position. The Juniors promised a big battle between the front row drivers when Pole position had to be decided by fastest lap time in the Pre-Finals after a tie on points after all of the racing. 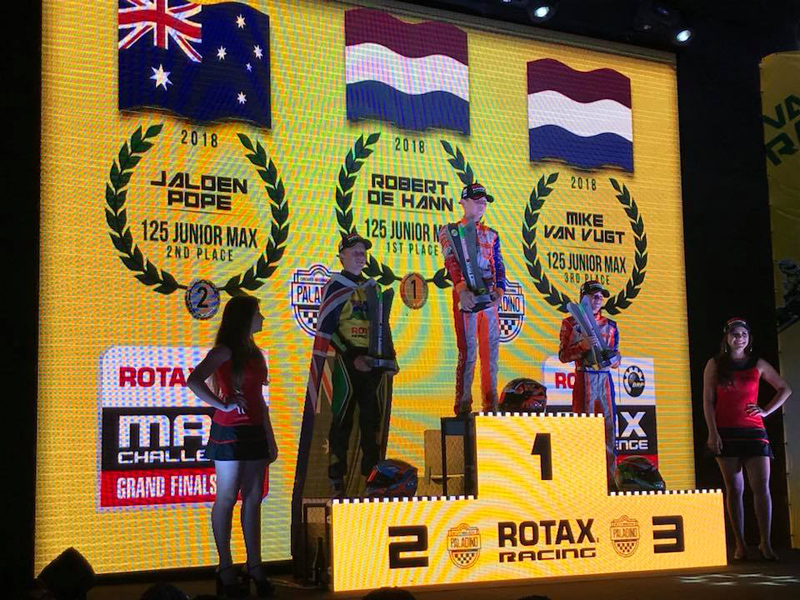 This gave Robert De Haan who was competing in his 3rd straight Grand Finals the advantage of the inside line which turned out to be vital as Jaiden Pope was muscled out and dropped back to 6th and into the clutched of the fighting pack. The UK’s Lewis Gilbert lead that chasing pack for a few laps whilst changing places constantly with Mike Van Vugt, Thomas Nepveu and Luca Mars. By Lap 6 Pope had managed to make his way through that packing started to chase down the leader. 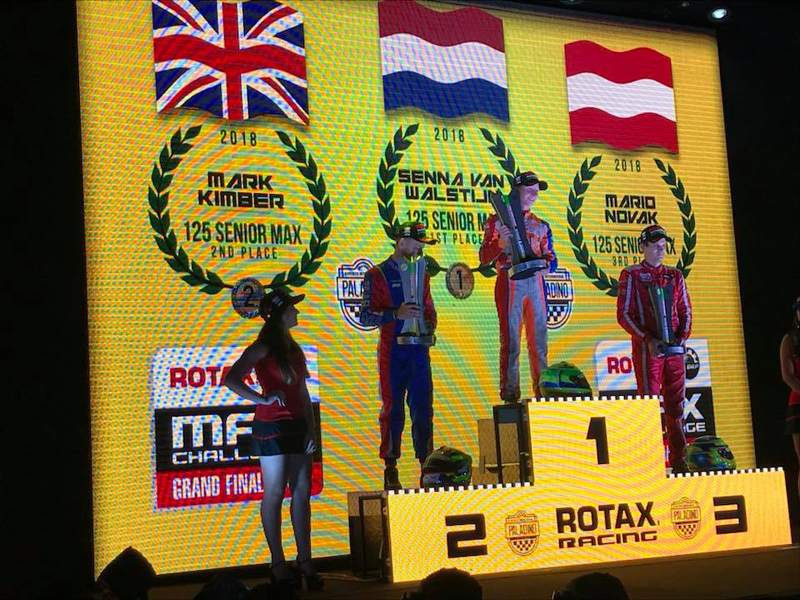 He got close, probably within a kart and a half, but just not close enough to make a move so it was The Netherlands that took the win with Robert De Haan, Jaiden Pope in 2nd and the other Netherlands driver and European Champion Mike Van Vugt in 3rd. Over the line you saw the contrast between the pure jubilance and celebration of De Haan versus the head down and disappointment of being so close yet so far for Pope. Hannes Morin had been the one to beat all week but unlike his heats he didn’t get a gap on the first lap was challenged and swapped places for the lead more than once until he was successfully passed by Petr Bezel on lap 2. The great performance showed by the Jordanian driver Manaf Hijjawi ended abruptly at the end of Lap 1 when he fired into the tyre barrier backwards. Normality resumed when Morin re-took the lead with a great move on Lap 5 and led the way until Lap 13. Behind this action the following pack of 10 karts or more at times battled it out sometimes rubbing wheels and trying to drive 4 wide. When Senna Van Walstijn made his way to the lead on Lap 14 from his starting position of 7th, this battling behind him meant he was instantly able to pull away and crossed the line over 3 seconds ahead of the rest. The battle behind was eventually won by Great Britain’s Mark Kimber and Mario Novak from Austria for 3rd. The biggest mover of the race was New Zealand’s Zac Stitchbury who moved up 21 spots to finish in 15th position and the only female qualifier for today’s finals, Hannah Greenmeier finished in 24th. The DD2 Masters category packed a massive punch in terms of experience and also Champions. The most decorated of them all was the pole man Cristiano Morgado had a dream start when his countryman Michael Stephen slotted in behind him at the start and although he pushed hard the first few laps to stick with him was unable too. It was Lap 4 when the New Zealander Fraser Hart made his move on the 2nd placed South African and tried to give chase himself. Behind these the fast Finnish driver, Antti Ollikainen was putting in fast laps but struggled to get past the two in front quick enough to stop Morgado getting away. He did make the moves and at the half way mark of the race he gave chase for the lead but was never quite fast enough to close the gap. Setting the fastest lap time (51.784) of not only the race but beating his previous event record was the other Kiwi Matthew Hamilton who again struggled to pass the slower karts in front of him without loosing too much ground on the Top 3. In the end it was the Cristiano Morgado that made Grand Final history yet again by winning his 5th Grand Final. This win made sweeter by the fact that Cristiano two years ago suffered a bad neck injury that made him think he may never race again. 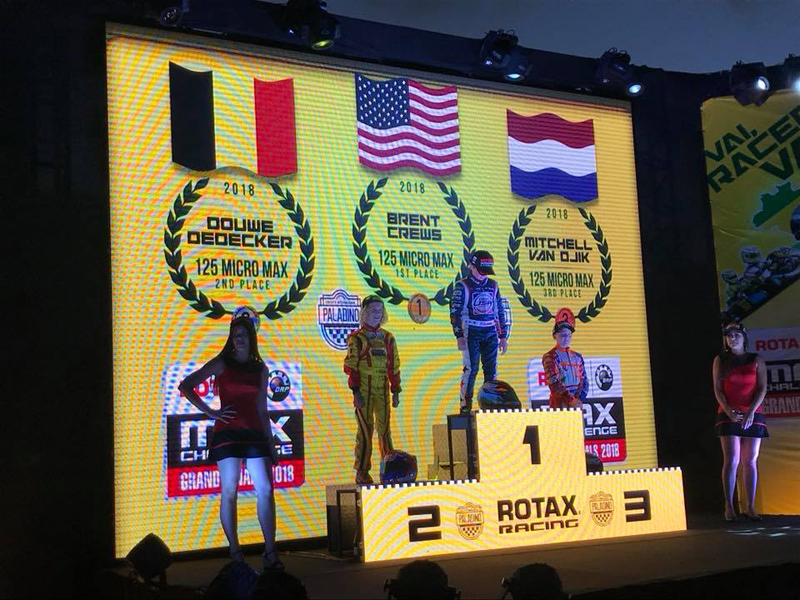 The final race of the week and the 2018 Rotax MAX Grand Finals saw the DD2 class take to the track and also promised a epic battle between the two drivers who had won the most races so far this week, Xen De Ruwe and Daniel Formal. Yet again the spectators witnessed a drama filled final and neither of the two protagonists was to celebrate the win. It started well for the ex-Belgium driver now racing for Solvenia, De Ruwe as he led the pack into the first corner with Formal close being determined not to let him pull out a lead. Italian Claudio Pagalirani hadn’t read the script though and made his move on Formal on Lap 1 to take 2nd. He maybe was a little too determined to not let the leader get away and on the very next lap made a move for the lead that resulted in him climbing over the back of De Ruwe and breaking the karts rear bumper. Pagliarani dropped right to the back of the field instantly but De Ruwe unaware of his damage continued and starting to chase Formal down who had grabbed the lead as a result. Ryan Wood started well and got up to 3rd in the pack behind but was unable to keep this position as Taylor Green field and Arnold Neveling both passed the Australian team member. Whilst all of this action was happening the Frenchman Paolo Besancenez was picking the karts off one by one from his starting position of P10. Xen De Ruwe was determined to take back the lead but just as he had caught up to the back of Formal his rear bumper completely fell apart and the Officials had no choice but to give him the mechanical flag. Distraught he pulled into the pits leaving the charging Besacenez to eventually make a move for the lead on Lap 18 of 20. Formal was able to hold 2nd ahead of the American Taylor Greenfield in 3rd that won the battle of the chasing pack. 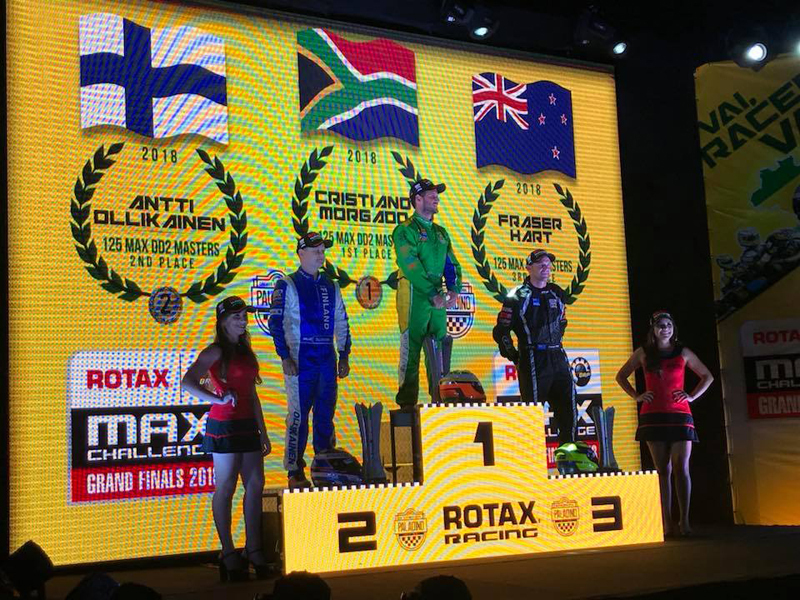 The first ever Grand Final with the Rotax Thunder karts took place here at Paladino and it didn’t disappoint. 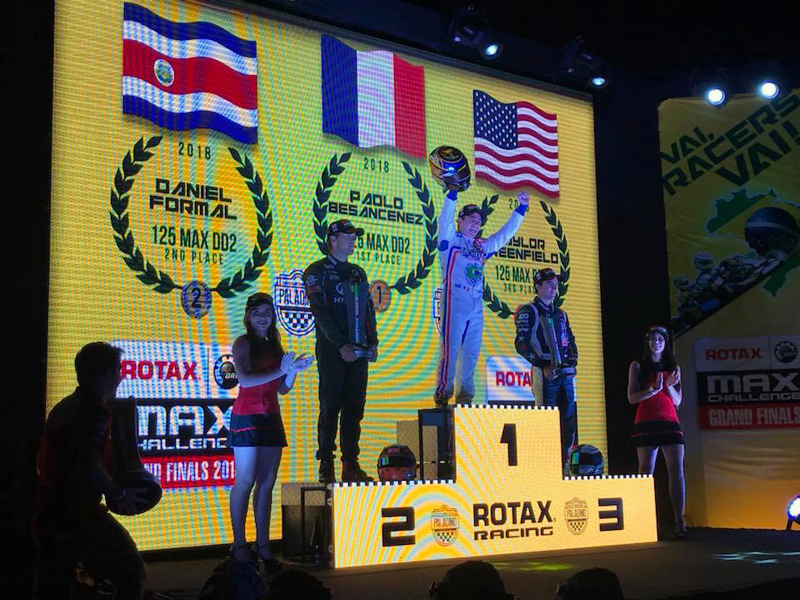 It was a lights to flag victory for the driver that had qualified through the ECK FIA-Americas cup held earlier in the week. The newly crowned German Champion had to start from P4 but made his moves up to 2nd position with fellow German Lukas Horstmann just 0.2 tenths behind to complete the podium.